This Friday, Colorado celebrates yet another Opening Day and there’s just something about being here in downtown Denver – the swarms of people, the sea of purple, the smiles that fill the streets – that makes you want to get out and be a part of it. Ticket or no ticket. The answer was the PaySimple Home Field Advantage. 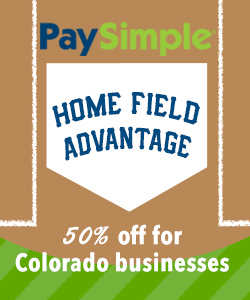 To help Colorado businesses be more efficient and successful with their businesses (in other words: hit one out of the park), we’re offering 50% off your first three months of PaySimple through the end of April. We’ll also be hitting the streets this Friday in LoDo to join the Opening Day festivities. Be on the lookout for some loud, but super-friendly, folks with PaySimple tees, big foam fingers, and Rockies gear. Come say hello and maybe even get some goodies. We’ll also be giving (and accepting) high-fives all day long. That’s it. And from our team to yours – thanks for being a part of the growing network of Colorado businesses. We’re here to help your business so you can love your business.